The city of Stevens Point has engaged the public in exploring possible reconfigurations of the Division/Church corridor within the city limits since January of 2013. This effort has been in anticipation of a total reconstruction of this vital urban corridor in the foreseeable future. The purpose and need of this reconstruction have centered on the corridor’s poor safety statistics, its poor pavement condition, its substandard lane widths, its inadequate bicycling and walking accommodations, and its lack of aesthetic qualities. Background information, including presentation materials from past public meetings and my blog posts about the project, can be found on the PPSP Division/Church project webpage. This has been a challenging project due to the many difficult constraints project engineers must address. From the outset, it was very clear that no individual would be entirely satisfied with the final design. For this reason, it is not surprising that this project has been controversial. Within the structure of the stated purpose and need, the objective of project staff has been to find an appropriate balance among the numerous stakeholders. 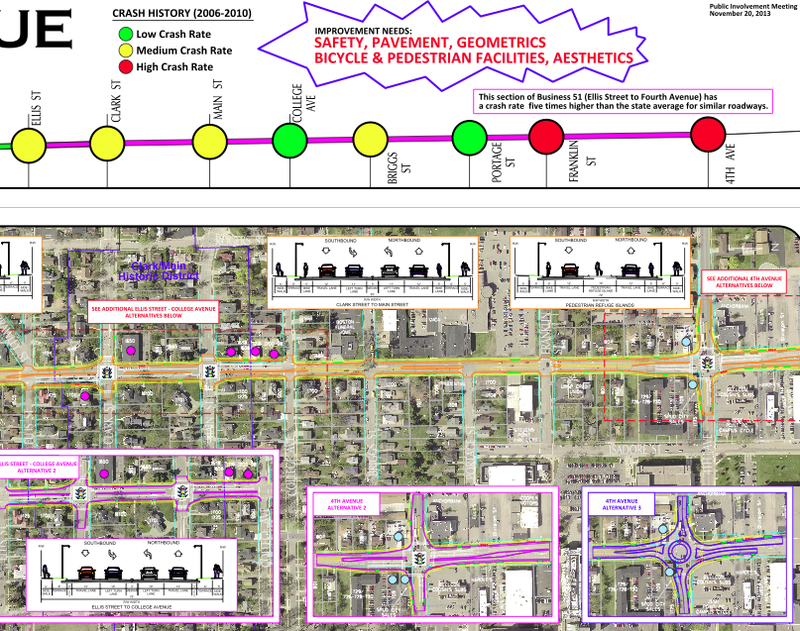 At the May Stevens Point Common Council meeting, alderpersons voted to prioritize the Hoover overpass project over the Division/Church corridor project. This decision left some loose ends to attend to for the Division/Church project. A key loose end is the fate of the contract with AECOM, the engineering firm hired to create the environmental assessment and 30% design for the corridor. 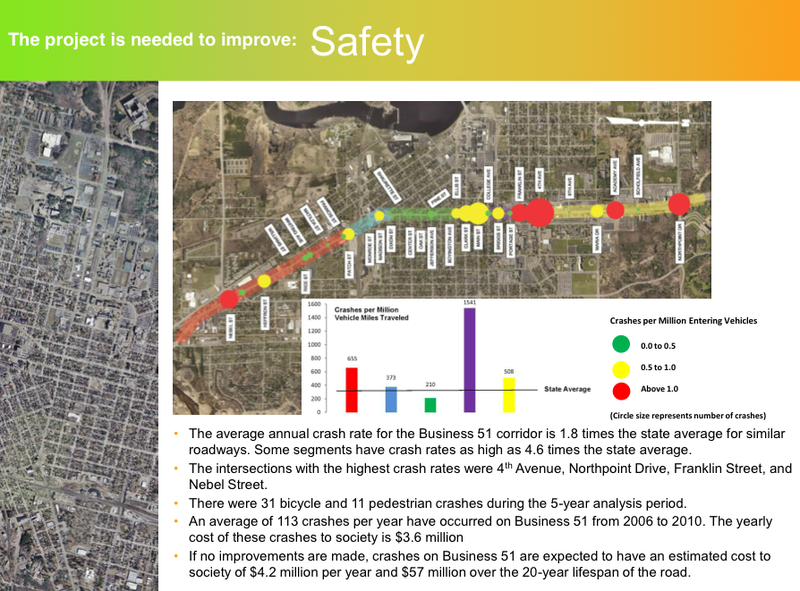 AECOM’s efforts resulted in design alternatives presented at a public meeting in November of 2013. In reaction to inappropriately hostile comments from some at that public meeting, the project stalled as the city investigated ways to move it forward constructively. Since then, there has been no sign of progress towards the selection of a preferred alternative. The agenda packet for the Board of Public Works meeting this past Monday included a document outlining financial details of the contract with AECOM. To date, $492,000 has been spent on this contract. The total budget for this contract was $820,000, leaving $328,000 in the budget for this project. These financial details also indicate that an amendment to the contract will be needed to complete the environmental assessment and 30% design. The estimated additional expense for this amendment is reported to be $176,000. The agenda packet notes include an outline of the rationale and estimated cost breakdown for this amendment. A decision the city must make is whether or not to instruct AECOM to complete the environmental assessment and 30% design. The city can choose to terminate this contract and use the budgeted $328,000 towards the Hoover overpass project. However, doing so will waste the $492,000 spent so far on this contract. By terminating the contract, the work done to date by AECOM would need to be redone before the Division/Church corridor can be reconstructed. City leaders have stated at recent meetings that in light of the reprioritization of the Hoover overpass project, the reconstruction of Division/Church would take place in approximately 10 years. The recent Board of Public Works meeting included action regarding this decision. The board voted to continue the process so that AECOM could complete the contracted tasks. This vote is only a recommendation, as the Common Council must make the final decision on this issue. That decision is expected to take place at the upcoming Common Council meeting. This meeting is scheduled for Monday June 16 at 7PM in the Council Chambers of the County-City Building (1516 Church St). Based on comments made by several alderpersons at this and other meetings, it is far from certain that a majority of the Common Council will concur with the recommendation of the Board of Public Works. My reaction to one such set of comments made by one of our alderpersons at the May Board of Public Works meeting can be read in this post. In light of the $492,000 already spent, voting to allow AECOM to complete the environmental assessment and 30% design should be an obvious choice. Unfortunately, several alderpersons have shown a severe lack of objectivity with regard to this process. Instead of accepting the controversial nature of this project and the reality of its constraints, these individuals seem to be in denial of the inevitable outcome of a design process that strikes a suitable balance among the numerous stakeholders while satisfying the project’s stated purpose and need. Based on trends at the federal and state levels regarding legal restrictions for reconstructing such major arteries that are part of our National Highway System, the eventual design for the reconstruction of the Division/Church corridor will almost certainly contain the major elements proposed in the alternative designs already created by AECOM. This is likely to be the case even if we waste the $492,000 already spent and, a decade from now, restart – at full cost – the environmental assessment and 30% design. At Monday’s Common Council meeting, it will be enlightening to discover how each alderperson votes on this matter. Although this vote is about the future of the Division/Church project, how each alderperson votes will reveal their ability to envision a vibrant future for Stevens Point and their talent to lead our city in that direction. We need visionary leaders for Stevens Point to thrive over the coming decades. In the vote expected on Monday evening, the mere question of continuing or terminating the current Division/Church project will be overshadowed by the revelation of how each of our alderpersons measures up to standards of visionary leadership necessary for our prosperous future.